Our plastic structures for outdoor use are an economical yet sturdy solution for playground fun. Choose between our options from Little Tikes Commercial and UltraPlay. Little Tikes Commercial is the biggest name in childhood recreation we are proud to be an offical dealer of theirs. Its Clever Climbers are roto-molded plastic structures that slot together easily, kind of like a game of Tetris (remember that?). They are full commercial grade, great for schools, daycares, homeowner associations, and more. But you don’t need any concrete or heavy machinery to install these structures, just a basic toolkit. Choose between 3 models: the All In, the Cut Loose, and the Jump Start. For ages 2 – 5 years. 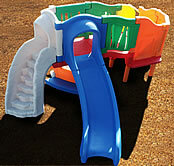 Plastic Play Structures :: Child Centers On Sale! 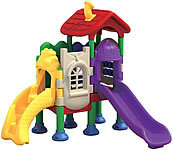 For a limited time, we’re offering these commercial-grade plastic play structures. They can be used in an indoor setting or outdoors. These fun play structures are appropriate for kids ages 2 – 5 years (except the model 6, which can be used up to age 7 years). Prices shown do not include shipping.